I love writing for the Orca Sounding series. The short form suits me, since I tend to write very plainly, even when I’m writing a full length book. I don’t much like ornate writing (as the authors I edit will tell you). In a Soundings, you have to pare everything down to the bare essentials— character, plot, setting, conflict, resolution—and make every word count. 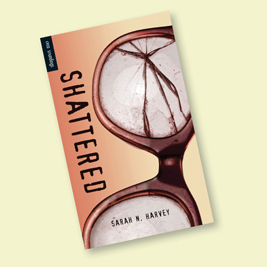 The idea for Shattered came from my interest in the notion of popularity—specifically the popularity (or lack of it) of teenage girls. The popular girls from my own high school years were blonde and tanned; their teeth were straight and white. Their boyfriends were hot and drove nice cars. I wasn’t one of them, but years later, my daughter was. So I started to look at it all differently. Maybe they weren’t so bad. Maybe they were smart and funny and complicated, just like my daughter. So I wrote a book about what happens to a popular girl when all the outward manifestations of her popularity are stripped away. March has a perfect life: beauty, popularity, a great job, a loving family and a hot boyfriend. So when she discovers that her boyfriend is cheating on her, she is hurt and enraged. She lashes out at him, he falls and is badly injured. March panics, flees the scene and then watches her perfect life spiral out of control. She changes her appearance, quits her job and tries to become invisible, until an unlikely friendship and a new job force her to re-engage with life.